Reference number for this case: 17-oct-54-Varigney. Thank you for including this reference number in any correspondence with me regarding this case. ... When they do not prove to the "Earthmen" that they have the imagination too beautiful! Walscheid (from our correspondent). -- Each province, if not every city, had its "saucer" which its "cigar" that its Martian (true or false). Apart from certain graceful young girls, the latter presented themselves in various forms: small, hairy or without weight, round and disproportionate heads, piercing eyes, point of ear, in short, forms which ... a priori ... do not attract sympathy. In Walscheid (Moselle), yet Martians of another form - but come to the facts. The prayer was scarcely finished, on certain evenings, when the city was alerted by childish cries, cries of anguish, fright ... of those who create the atmospheres of black novels. And all at once the walkers ran up and, with them, swelled the enormous news, which was transmitted like a thunderbolt: Martians were there, preparing to attack Walscheid. And with a trembling finger, the face streaming with tears, the toddlers, hidden behind the bravest of their elders, pointed out on a terrace there, behind the house, a "commando" Of a good dozen subjects. In the ambient shade, which was hardly disturbed by public lighting, one indeed distinguished the rather high shapes, angular, and at the same time bulky of those who spied before the invasion's H hour. The resistance was soon organized, and the young men came running, equipped with the most various weaponry: sticks, axes, forks, held with a firm hand, announcing the solemn moment of the assault. And, in the noisy atmosphere of the moment, in the midst of cries and tears, more than one volunteer felt With the excitement of the combat, the feeling of heroism and the certainty of victory. The assault was going to be given. Reinforcements had come, which children hastened to seek, When, in the tumult, the owner of the house awoke at last, and appeared at his door. His eyes still swollen from his interrupted sleep. He was warned at once, with the utmost caution, of the unusual presence of the Martians on his terrace. And no doubt at Walscheid no one ever heard more formidable bursts of laughter than that which gushed forth and broke over the astonished crowd. The stupefaction of some and the astonishment of the others were scarcely blunted when finally the new Which was going to relax them came. "Martians, do you mind, these are my chrysanthemums... The radio had announced the frost, so I covered them, that's all!" And in the general appeasement, perhaps some will they always regret that they were not the brave fighters of a new war of sidereal level. Saint-Loup-sur-Semouse (from our correspondent). -- The luminous nocturnal visions multiply to such an extent that we do not despair of seeing one day out of order on our planet one of those innumerable discs or cigars whose presence has been reported for quite some time. While waiting for this breakdown, if desired but very problematic, because according to many testimonies, these devices are extremely sophisticated, we are reduced to statements of those who had the chance to see one of these mysterious craft. Thus on Sunday, around 08:30 p.m., people from Varigney (the Haute-Saône) going to the movies in Conflans, saw, after passing the railway crossing, a kind of fire even redder than the setting sun, but of almost square shape, according to one of the witnesses (others, however, assert that the machine was rather rounded). It was in any case motionless at the highest and farther part of the pasture along the road from Conflans to Saint-Loup, against the Bowling game of the Beuclair coffee shop. Nobody then approached to see more clearly what it was. Only Mr. Jean Beuclair, alerted by Mr. Barrat, a barrister, entered the pasture and remained there for observation, accompanied by his eldest daughter, Jeanne, aged 16, who was standing about ten yards behind. Mr. Beuclair was to declare that he had seen this kind of globe approach noiselessly, very quickly, until it was less than twenty meters from him, descending the slope of the meadow. At that moment it seemed to him that the apparatus emitted white radiations and other reds, juxtaposed. "These radiations," he said, "were insufficient to illuminate the meadow, but strong enough to influence my sight and prevent me from approaching". And he goes on: "I saw two kinds of legs supporting the apparatus which, at a certain moment, folded. I shouted, but received no answer." Her daughter corroborates his statements in part, but she is less affirmative and less precise, having seen the "Thing" from further on. On the objections of his wife and other members of his family, who were very frightened, although they saw nothing terrifying, M. Beuclair and his daughter withdrew. When Mr. Beuclair came out a few minutes later, the apparition had vanished. The manner in which the craft disappeared thus remains mysterious. The gendarmerie of Saint-Loup, who went to the scene, found no abnormal trace. This unique testimony, if it strengthened the convictions of some who believe in flying saucers, also increased the skepticism of others. French ufologist Aimé Michel notes that on October 17, 1954 at about 08:30 P.M. in Varigney, several people were driving on secondary road 10 in the direction of Conflans-sur-Lanterne in the Haute-Saône. After they crossed the railway crossing which separates the village from the road, they saw a sort of sharp red luminous body, still, which stood in the highest part of the pasture which bordered the secondary road 10. The witnesses stopped at the edge of this pasture in the coffee held by Mr. Beuclair, of Varigney. Mr. Beuclair as well as the railway crossing keeper Mr. Barrat were alerted and everyone looked at the phenomenon from a distance. Then, Mr. Beuclair and his daughter Jeanne decided to go to go observe it more closely, crossed the fence and started to climb the slope of the pasture, while the other witnesses remained observing from where they were. After Mr. Beuclair and his daughter walked ten meters, the object started to move, descended the slope while approaching the witnesses who were terrified by that. The object stopped at about twenty meters of them. Everyone clearly saw the circular shape of the object which was half-spherical from above. Mr. Beuclair and his daughter saw that suddenly, some sort of white and red radiations spout out in parallel from under the machine. Mr. Beuclair shouted, "what it this? Who goes there?" but had no answer. His wife however called him, begging him to come back, and he then moved back. The sighting continued during still a few minutes, then the object flew away at high speed. Michel Carrouges, based on Aimé Michel, reports that on October 17, 1954 at 08:30 p.m., a very precise and very rich observation took place, with many witnesses of which the first are motorists who got out of their car to observe a luminous thing, sharp red, motionless in a pasture close to a road near Varigney in the department of the Haute-Saône. These motorists alerted Mr. Barrat, a gate-keeper, and Mr. Beuclair, coffee shop owner, as well as his wife and their daughter. These four people lived in houses at the edge of the road beside the pasture. Everyone came out and looked at the phenomenon with an extreme attention. The object had a circular shape, hemispherical on the higher part. Mr. Beuclair and his daughter Jeanne crossed the fence of the pasture and approached the object. The object in its turn then approached them: "it went down quickly towards the two curious terrorized people and stopped at some 20 meters from them", indicates Aimé Michel. There was a deadly silence. White and red radiations then spouted out under the apparatus. The coffee owner shouted: "What is it? Who goes there?" but there was no answer. His wife shouted at him from the road, begging him to return, and Mr. Beuclair moved back to join her. The observation still lasted a few minutes. Michel Carrouges comments on the high interest of the case because of the number and the variety of the witnesses, of the short distance at which they were, of the luminosity of the strange object that all saw, and by the behavior of Mr. Beuclair and his daughter who go towards the object, this unknown object which then also moves to meet the witnesses, "and suddenly in this "fantastic" scene, two shouts, so human, of the man and of his wife." Elsewhere he notes that the observation distance was 20 meters and the sighting duration a few minutes. Oct. 17, 1954, 08:30 P.M. Varigney (France). Several witnesses, among them Mr. Beuclair, a policeman, saw a bright red dome-shaped object descend to ground level 20 m away. The underside showed red and white lights. (M 188). October 17, 1954, Varigney, France, 8:30 P.M. Motorists stopped on route D-10 when they spied a bright red luminous object in the fields. M. Beuclair and his daughter Jeanne walked closer, when suddenly the object moved and swooped toward them, coming within 60 feet. Now they could see its peculiar form, a hemispherical body with a flat bottom. All at once, the Beuclairs reported, radiation burst out from the bottom in parallel streams of red and white. The two authors indicate that in Dompierre-lès-Conflans in Haute-Saône on October 17, 1954 to 20:30, several people take the departmental road D10, in the direction to Conflans-sur-Lanterne in the department of the Haute-Saône. Having gone past the railway crossing which separates the village from the road, a kind of luminous element, of a sharp red color, appears to them, motionless in the highest part of the meadow which borders the D10 road. At the bottom of this pasture, there is a coffee shop in the location called Varigney. The motorists stop, alert the tenant as well as the gate-keeper of the railway crossing. Everyone looks at the scene from far, then the coffee shop owner and his daughter decide to go to see more closely. The two courageous witnesses, pushed by curiosity, had already crossed some meters when the luminous object starts moving, goes down quickly towards the two terrorized "explorers" and stop at some twenty meters of them. In the absolute silence, everyone sees, very clearly, the circular shape of the object, half-spherical in the height. Suddenly, reported the man and his daughter, some sort of white and red juxtaposed "radiations" spout out in parallel from under the apparatus. The coffee-shop owned calls, "What is this? Who goes there?" Getting no answer, and his wife begging it from far to move away, he moves back accompanied by his daughter, to reach the bottom of the meadow. The spectacle still lasts a few minutes, then the machine flies away at high speed. The authors indicate that the sources are the Vallée Catalogue, case 280; Aimé Michel in "A Propos des S.V." page 228; Quincy; Michel Carrouges in "Les Apparitions de Martiens" pages 91-92. It was a red glowing hemispherical machine that came down to a landing near Rt. D-10, a road that passed through the village of Varigney. The object was so obvious, parked as it was on a slight rise in the ground, several motorists stopped to gape. M. Barret, a crossing guard, a cafe owner named Beauclair and his daughter Jeanne, were among the witnesses that gathered at the spot to stare at the mysterious object. When some of the witnesses got up enough courage to approach the object, it rose to a point where it was out of reach, about 60 feet high, where it emitted red and white beams of light from its underside. 142. 142. Michel, Aime. Flying Saucers and the Straight Line Mystery, p.188. Godelieve van Overmeire indicates that on October 17, 1954, in France, in Varigney, in the Haute Saone, Mr. Beuclair, police officer, and other witnesses, saw at 20:30 a brilliant object, sharp red, half spherical on the top, go down on the ground 20 m from them. Red and white lights were visible under the craft. The source is given as Jacques Vallée: "Chronique des apparitions ET" - Denoël 1972 - Coll. J'Ai Lu - p. 284, 285. Godelieve van Overmeire indicates that another version is: "The witnesses are numerous. The first are motorists who got out of the car to observe a sharp red luminous body, motionless in a pasture near a road close to Varigney, at 20:30. They alert Mr. Barrat, a gate-keeper, and Mr. Beuclair, café owner, as well as his wife and her daughter (...) Everyone is outside and look at it with an extreme attention. The object has a circular form, it is hemispherical at the higher part. Mr. Beuclair and his daughter Jeanne cross the fence of the pasture and approach the object. The latter did the same, it descended fast towards the two curious and terrorized people and stopped at some twenty meters of them. There was a deadly silence. White and red radiations spouted out under the craft." Luc Chastan indicates that in the Haute Saone in Dompierre lès Conflans on October 17, 1954, at 20:30 hours, several people "take the D10, in direction of Conflans-sur-Lanterne, in the Haute-Saône. Having passed the railway crossing which separates the village from the road, a kind of luminous body, of a sharp red, appears to them, motionless in the highest part of the meadow which borders the D10." "At the bottom of this pasture there is a coffee shop at the location Varigney. The motorists stops, warns the owner Mr. Beuclair, his wife, his daughter Jeanne as well as the gate-keeper, Mr. Barrat. Everyone looks at the display from far away, then the coffee shop owner and his daughter decide to go to see more closely. Our two courageous witnesses, pushed by curiosity, had already crossed some meters when the luminous object starts moving, to go down quickly towards the two terrified "explorers" and stops at some twenty meters from them." "In absolute silence, everyone sees, with the greatest clarity, the circular object, half-spherical on the top. Suddenly, the man and his daughter report, kinds of white and red juxtaposed "radiations" spout out in parallel under the apparatus." "'What is that? ", the owner shouted; "who goes there?'" "Getting no answer, and his wife begging him from further away to come back, he moves back accompanied by his daughter, til the bottom of the meadow. The display still lasts a few minutes, then the machine flies away at high speed." Jerome Beau indicates that on Sunday, October 17, 1954, at 20:30 in "Varigney (France), several witnesses, among them Mr. Beuclair, police officer, see 1 shining object ,hemi-spherical sharp red over it, go down on the ground at 20 m from them. Red and white lights were visible under the apparatus." Jérôme Beau does not indicate a source. The website indicates that on 17 October 1954 at 20:30, in Varigney D10, France, an "object was sighted that had an appearance and performance beyond the capability of known earthly aircraft. One disc was observed by a male witness in a pasture." The sources are indicated as Michel, Aime, Flying Saucers and the Straight-Line Mystery, S. G. Phillips, New York, 1958; Bowen, Charles, The Humanoids: FSR Special Edition No. 1, FSR, London, 1966; Vallee, Jacques, Computerized Catalog (N = 3073); Vallee, Jacques, Challenge to Science: The UFO Enigma, Henry Regnery, Chicago, 1966; Vallee, Jacques, Preliminary Catalog (N = 500), (in JVallee01); Vallee, Jacques, A Century of Landings (N = 923), (in JVallee04), Chicago, 1969; Schoenherr, Luis, Computerized Catalog (N = 3173); Binder, Otto, What We Really Know About Flying Saucers, Fawcett T1863, Greenwich, 1967; Olsen, Thomas M., The Reference for Outstanding UFO Sighting Reports, UFOIRC, Riderwood, 1966; Hatch, Larry, *U* computer database, Author, Redwood City, 2002. The website indicates that on 17 October 1954, at 20:30, in Varigney, France, "several witnesses, among them Mr. Beuclair a policeman, saw a bright red dome shaped object descend to ground level 20 meters away. The underside showed red and white lights." "A flying disc was observed." "One red ball was observed by a male witness in a pasture (Beuclair)." On October 17, 1954, several people circulating on the D10 saw a sharp red luminous object in a meadow. The motorists stop to observe the strange phenomenon. Two of the witnesses, an innkeeper and his daughter go away to check out what it is... the object then starts to move. Radiations escape from it... terrorizing the witnesses. At the end of a few minutes, the object flies away. It was one of the most intriguing episodes of this " year of the UFO " in France. *Oct. 17, 1954 -At 8:30 p.m. in Varigney, Haute-Saone department, France several witnesses, among them policeman Beuclair, saw a bright red dome-shaped object descend to ground level 20 meters away. The underside displayed red and white lights. (Sources: Aime Michel, Flying Saucers and the Straight Line Mystery, p. 188; Jacques Vallee, Passport to Magonia: A Century of Landings, p. 232, case 280; Thomas M. Olsen, The Reference for Outstanding UFO Reports, case 56). 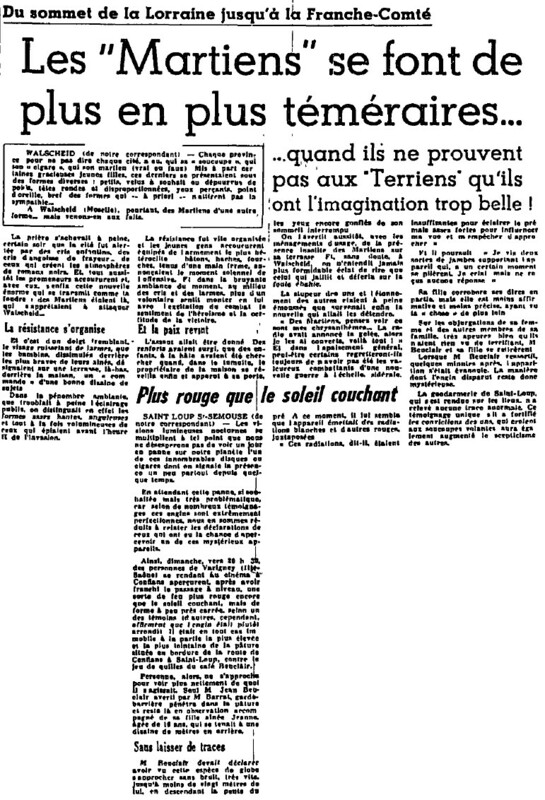 [er1] Article in the regional newspaper L'Est Républicain, France, page 7, October 19, 1954. [mc1] "Les Apparitions de Martiens", book by Michel Carrouges, (aka Louis Couturier), Fayard publisher, France, pages 80,81, pp 91-92, 1963. [---] "The Reference for Outstanding UFO Sighting Reports", book by Thomas M. Olsen, UFO Retrieval Center (UFOIRC), USA, 1966. [am1] "A Propos des Soucoupes Volantes", book by Aimé Michel, reprint of "Mystérieux Objets Célestes", Planète éditeur, France, page 228, 1958. [am1] "Mystérieux Objets Célestes", book by Aimé Michel, Seghers publisher, France, page 250, 1976. [fr1] "OVNI, Premier Dossier Complet des Rencontres Rapprochées en France", book by Michel Figuet and Jean Louis Ruchon, Alain Lefeuvre publisher, France, pp 179-180, 1979. [lg1] "The Fifth Horseman of the Apocalypse - UFOs: A History - 1954 October", monography by Loren Gross, USA, pp 60-61, 1991. 0.1 Patrick Gross December 4, 2005 First published. 1.0 Patrick Gross February 4, 2009 Conversion from HTML to XHTML Strict. First formal version. Additions [go1], [lc1], [ud1], [ud2]. 1.3 Patrick Gross June 30, 2010 Addition [jv5]. 1.5 Patrick Gross December 7, 2016 Additions [er1], [lg1], [ub1]. This page was last updated on December 7, 2016.